Augmented Reality (AR) combines 3D visualization, multimodal interaction, animation and direct manipulation in a hands-on learning experience that is able to enhance the students' motivation to learn. Designers and educators need a deeper understanding of the key factors that drive learners' acceptance and continuing interaction with an AR-based educational system. A concern for educators is to understand how these factors interact and to what extent each factor contributes to the acceptance of the AR technology. This work further extends the technology acceptance model by included three additional constructs that point to the ease of learning how to use an AR-based application (learnability), perceived efficiency, and cognitive absorption. The results show that the perceived enjoyment is the main determinant of the intention to use having a greater positive influence than the perceived usefulness. The perceived efficiency and perceived cognitive absorption have only indirect effects on the intention to use, which are mediated by the perceived usefulness and perceived enjoyment. Augmented reality technologies have a remarkable potential for educational use (Bilinghurst, 2003; Chang et al, 2010; Cai et al., 2014). 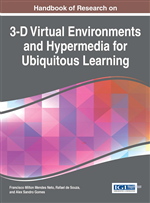 AR makes possible to create more engaging learning environments by integrating various real life objects in a powerful computer graphics environment which is featuring 3D visualization, multimodal interaction, and animation (Duh & Klopfer, 2013). Manipulating real objects from the real life makes learning a hands-on experience and enables learning by doing in a learner-centered approach, which in turn favors a faster and better understanding of key concepts of a lesson (Lamanauskas & Vilkonis, 2008; Krauss et al., 2009; Maier et al., 2009). Augmented reality applications are interesting, attractive, and enjoyable (Liu et al., 2007; Pribeanu & Iordache, 2010; Correa, 2013; Tsai et al., 2014). There is an increasing interest for to develop educational applications that are both utilitarian and hedonic (Heijden, 2004; Chesney, 2006; Haugstvedt & Krogstie, 2012), since this is enhancing the students’ intrinsic motivation to learn. AR educational systems are expensive for many reasons. First, computer graphics techniques require advanced hardware-software infrastructures and are difficult to develop. Second, AR systems that are integrating real objects are relatively unique since customized interaction techniques are needed for each particular real object. Third, graphical interaction is no longer enough, many AR systems needing multimodal interaction (haptic and audio) that are further increasing the development costs. Last but not least, educators’ expertise plays an important role in creating applications that promote both utilitarian and hedonic values. Therefore, designers and educators need a deeper understanding of the key factors that drive learners’ acceptance and continuing interaction with an AR-based educational system (Balog & Pribeanu, 2010; Wojciechowski & Cellary, 2013). An important goal when evaluating AR-based applications is to understand how these factors interact and to which is the contribution of each to the user acceptance. Technology acceptance model (TAM) was developed by Davis (1989) and Davis et al. (1989) to explain and predict the user acceptance of information systems. TAM explains the user acceptance by two key factors that influence the behavioral intention to use a technology: the perceived ease of use and perceived usefulness (extrinsic motivation). The model was extended by Davis et al. (1992) to include the perceived enjoyment (intrinsic motivation) as a key determinant of use in information systems that promote hedonic values. This study further extends the technology acceptance model by including three additional constructs that point to the ease of learning how to use an AR-based application (learnability), perceived efficiency, and cognitive absorption. Learnability refers to the ease of understanding, learning and remembering how to use an application. Perceived efficiency refers to the better and faster understanding as this is a recognized outcome of using the AR technology (Lamanauskas & Vilkonis, 2008; Iordache et al., 2012). Cognitive absorption refers to the state of total engagement when the attention is focused on the interaction with the application (Argawall & Karahanna, 2000). Perceived Cognitive Absorption: The state of total engagement when the attention is focused on the interaction with the application. Technology Acceptance Models: Theories and models that explain the user acceptance of information systems. Perceived ease of use: The degree to which a person believes that using a particular system would be free of effort. Perceived usefulness: The degree to which a person believes that using a particular system would enhance his or her job performance. Perceived Enjoyment: The extent to which using a specific system is perceived to be enjoyable in its own rights, aside from any performance consequences resulting from system use. Perceived Efficiency: The better and faster understanding and learning as an outcome of using the application. Perceived Learnability: The ease of understanding, learning and remembering how to use an application.